Whenever teeth are lost the most successful method of replacement are dental implants. The loss of a tooth leads inevitably to the loss of the supporting tissues and changes to the adjacent structure. Only a dental implant is able to stop this degeneration. It supports the surrounding tissues and allow to create a life-like restoration of the original situation. Dental implants are now so advanced, that we can enjoy success rates of up to 98% – higher than any other treatment in dentistry. Recent advances have made the implant more reliable and the procedure less traumatic. The implant itself remains invisible supporting the surrounding hard and soft tissues. It mimics the function of the root of a tooth and hereby prevents the collapse of the area. The visible portion of the new tooth is screwed or cemented onto the implant to allow to individualize it better. The drawing shows you the most common composition to replace a front tooth. 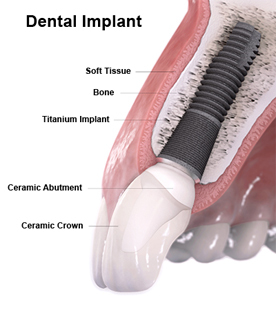 The cost of implants depends on the aesthetic requirements and supporting tissue for the implant. Depending on circumstances the cost for a single implant can range from £2,000-£2,500; in a consultation and with the appropriate 3D x-rays a full estimate can be provided. A front tooth had to be removed due to internal damage – the nerve started to eat up the inside of the tooth. You can seen the ceramic abutment conected to the implant and the new ceramic crown. Was a tooth lose due to infection, it is ofteh necessary to restore lost tissue in addition. This is also possible but the treatment may vary in extend and complexity. In this case we were able to utilize the existing tissue to restore the original look. As you can see, dental implants can successfully restore missing teeth. It is also possible to restore an entire smile with implants. If you would like to know more about the possibilities, why don’t you give us a call?